Made of melamine, the plates by Design Letters are particularly light and at the same time surprisingly robust. The ideal dishes for children or for a picnic. The resistant melamine plates from the children's collection by Design Letters are the perfect dishes for little ones and foodies. In the flat or deep versions, the plate is suitable for soups, but it can also be used for (breakfast) breads and other meals. Even outside the kitchen, the Design Letters tableware is excellently suited for picnics and camping due to its robust build. The melamine plates by Design Letters are adorned by letters of the typography by Arne Jacobsen. The alphabet borders the edge of the plate. S like Soup or B like Bread – children can playfully learn the letters of the alphabet while eating. The distinctive letters that adorn the tableware of the children's collection by Design Letters were developed by Arne Jacobsen. He originally designed the font in 1937 for the interior inscriptions of the Aarhus town hall. 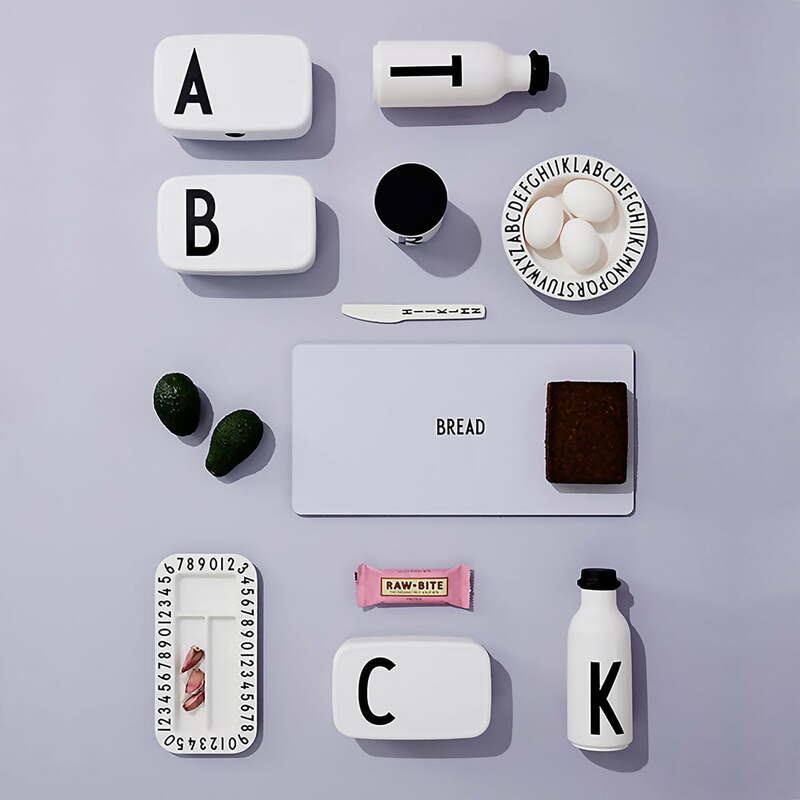 The numbers, letters and characters nowadays grace various home accessories, textiles, office accessories and toys of the Design Letters collections, which can be used in any living space – from the children's room to the kitchen. 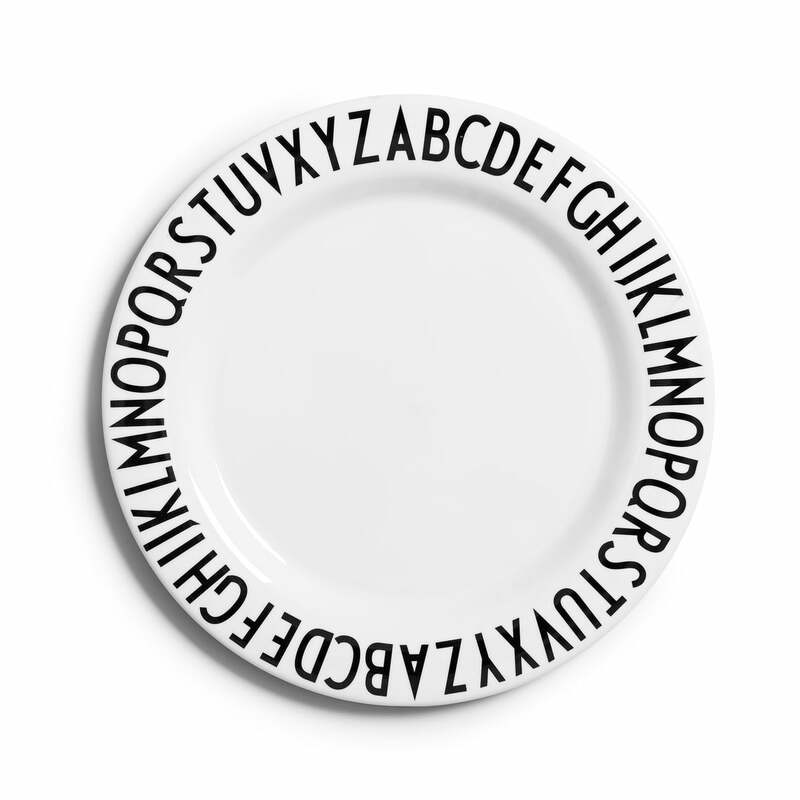 Individual product image of the flat, white AJ melamine plate with the alphabet in black letters on the plate’s edge. The plate has a diameter of 20 cm and is not suitable for use in the microwave.